Hobie Alter and Dave Sweet independently showed that a polyurethane foam surfboard was possible. Rodger Jennings, Chuck Foss, and Harold Walker pioneered the first successful commercial blank business selling blanks directly to surfboard builders. A lot of other people were involved including myself. All of the resins, supplies, processes, and equipment were very original innovations. Upon founding Clark Foam I begin using different foam formulations, processing methods, and equipment than the other blank manufacturers. Today my plant is almost all original designs, built in-house by our staff and myself. The small amount of equipment purchased outside of Clark Foam was built to my specifications or modified by me for our unique process. To sum this up no one in the United States or for that matter the rest of the world uses equipment and a process like mine. It is very unique and there was nothing on earth ever built this way before. The first Australian manufactured balsa/fibreglass boards, three only, were by Rodger 'Duck' Keiran soon after the Olymic Carnivals, but a lack of balsa wood supply meant that the design was not available for general use. The impact of the US Malibu boards was severe to encourage builders to experiment with a variety of alternative manufacturing techniques. Possibly based on a Popular Mechanics article published in 1953 detailing the constuction of a Styrofoam Surfboard, several used a combination of polystyrene foam and expoxy resin. McDonagh at Freshwater (Greg McDonaugh in Pollard, page 56) and Scott Dillon with Noel Ward at Bondi used polystyrene foam that was commerically available for insulation. In a shed in Wellington Lane, Bondi, Dillon and Ward glued foam blocks together, timber without stringers, and shaped the board with a course rasp ("Surform"). The boards were glassed initially with epoxy resin and 16 oz woven rovings, then coated with a 5 oz cloth film. The variation in colour and texture of the glassed board required a coat of paint to finish the board. South Bondi Board Club member, 'Bluey Mayes', ordered a board with a large gold M painted on the nose. One noted alternative, possibly dating from this period was a board constructed of two fireglass molds, joined at the rail with an adhesive black plastic bead. The board was filled with a course matted substance for floatation and featured a fin box. The noted example was green on the bottom with a white deck. "Embracing modern technology, the lighter, shorter, and more manouvrable American malibu surf board gained popularity after lifeguards from Hawaii and California demonstrated its capabilities at Torquay in 1956 (136). According to Cronulla's Bill Eady and Gus Staunton, the hedonistic 'free spirit' of board riders was at odds with the core humanitarian role of disciplined surf lifesavers, which was to protect surf bathers from the perils of the sea. Consequently there was animosity between board riders and surf lifesavers on Cronulla Beach. Apart from philosophical differences, the danger of of surfboard riders crashing into surf bathers was immense. Therefore, as the protectors of Cronulla Beach it fell to lifesavers to enforce Sutherland Council regulations (137), such as in 1957 containing board riders to a section of North Cronulla Beach known as 'the alley' (138)." By 1960 most builders were producing a stable, if not perfect, polyester blanks. Some manufacturers resorted to using a 'swelling box' to allow the blanks to stabilize before shaping. The standard Malibu was a foam/fibreglass laminate with a redwood stringer, 9 ft –10 ft 6”. Extra features could include multiple stringers, tail blocks, and pigment colours. Fins were either fibreglassed timber or solid fibgreglass. Some builders continued to use balsa, for example Wally Caryle, though mostly this was reserved for Gun boards. Noted examples were built by Les Patterson at Scott Dillon Surfboards & later at Dale Surfboards. Sport Magazine for Nov 1960 article "Why Surf Clubs Are In Trouble" discussing the increasing popularity of board riding. Prone craft continued to be made in various designs, most home builders continuing to use plywood. Professional manufactures quickly produced Belly and Kneeboard in balsa wood and then foam. See Paipo Catalogue, 1960 - 1964. "I was a Bondi boy, imported from Canada in 1960. Johnny O'Donovan, old Vic Hogan, Noel Ward, Billy Bushel, of course the young gremmies, Kevin Brennen etc. Other members of SBBC included Jim Robinson, Mick McKelvey, Andy 'Cucuracha' Cochrane, Dennis Colette, Johnny Nobel, and Rick DeRuiter. 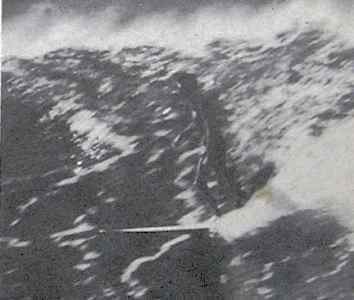 I have a picture of a wave at Nielson Park circa 1961. 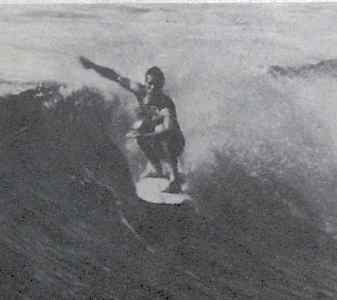 Bluey Mayes girlfriend, Brenda Backhouse was probably, if not the first woman surfer in the Eastern suburbs. Kerry Yates was the local "Gidget" and ended up with the Sydney Daily Telegraph writing weekly surfing articles. One of her articles about Bob McTavish stowing away to Hawaii resulted in him getting caught and deported back to Aussie." - Mike Bennett (formerly the "Canadian Kook", South Bondi Board Riders Club, circa 1960) of Scottsdale, Arizona, emailed these notes in June 2011 (edited). In 1917, the most consistently noted female surfboard rider at Bondi Beach was Kathelene Musgrave. Also wrote a series of articles in the early 1960s for the Australian Womens' Weely. An Australian journalist whose meeting with Paul benefited her career. Glenn A Baker relates the event in his book The Beatles Down Under. "Kerry was seventeen years old and working for Women's Weekly when the Beatles arrived in Sydney in June 1964. She was among the large group of reporters and photographers waiting in a corridor in the Sheraton hotel, hoping to get a story on Paul as he was celebrating his 22nd birthday. Paul decided to have a few words with the press, but as soon as he saw Kerry he went straight to her and invited her to his room for an interview. Kerry commented, 'I had long blonde hair and a pink sweater and I must have stood out from all the grey and brown suits because Paul made a beeline right for me and invited me up to his room. He let my photographer take shots of him surrounded by his presents and the next week we ran one of them on the front cover with my "exclusive" story inside. For years I've been asked what I had to do to get that scoop, which really did help my career. I know that everyone wants to know but I'm not saying if I did it or if I didn't.' "
- Bill Harry: The Paul McCartney Encyclopedia, July 2011. "Was in the first group with Bluey to surf Green Island, down south. Also, the Bondi boys were among the first visitors to the far south coast and even down to Bells. The first groups that went to Ulladulla were around 1960, refer to Ivan Johnson's history of the Mollymook SLSC, bottom of page 32." - Mike Bennett, email June 2011 (edited). "At the start of the season a visit to the area by members of the South Bondi Boardriders Club [many of whom were members of the Bondi SLSC], was to have ramifications to the local area. The visit of the surfers' from other areas like Bondi on 'surfaris' seeking out new, unspoiled waves, introduced the youth to a new culture that did not include surf lifesaving in the equation. Basically it meant a competition in coastal areas for the pool of local youth which has continued on ever since." Image, Page 31: "The first boardriders. From left Ivan Johnson, Bob Evans, Ian Hunter"
Board portraits, two Pig boards and one Malibu, outside old Mollymook clubhouse.. Image, Page 32: "Bob Cairns, club member posing in his 'neck to knee' costume." Balsa Pig board portrait outside old Mollymook clubhouse. - Johnson: Mollymook SLCS (2010) pages 31-32. Ivan Johnson noted that his first board was bought from Bill Clymer from Sydney by a local who used it briefly before onselling to Ivan. - noted in phone conversation, July 2011. Bourke, Friday 4 November 1960, page 12. Surfboard riders using beaches throughout the Syd ney metropolitan area this year will have to pay a 5/- registration fee. Seaside councils have agreed to do this in an effort to control riders causing accidents among swimmers. Licensing the boards will en able surf club members and Council rangers to identify board owners who cause trouble. The officials have the power under the new regula tions to confiscate boards. The registration will take the form of a sticker attached to the centre of the board 12 inches from the nose. Manly Council beach supervisor, Mr. R. Brewster, said the regulations.would help reduce the number of accidents which occur each year between swimmers and board riders. 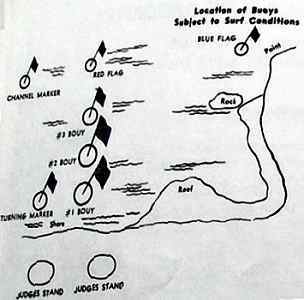 He said seaside Councils had adopted a common method: of marking areas reserved for surf riders. This would; enable anyone going to different beaches to know exactly where they could ride boards. Surf club members are exempt from the license fee which lasts 12 months. Formation of Dee Why Surfing Fraternity, DY, NSW. Not sure if it is of note for you but Dee Why Surfing Fraternity is currently updating its archives. As you may know DYSF is Australia's oldest Board riders club. Established in 1961 we have never stopped charging which we think may well make us the longest continuous running club in the world as many have come and gone and occasionally been resurrected but to our knowledge no other club has been going that long. Sorry to all who thought otherwise but we were around before Surfing Australia - in fact Midget was our first President a couple of years prior to being inaugural president of Surfing Australia..
And if you check out our "Members" page you'll see a link to details regarding the DVD " Why Dee Why" ....And No, as far as I know , no proceeds from the DVD are going to the club! damn.. I kinda think we're part of Australian Surfing History. best regards and keep up what I'm sure is at times the onerous but always worthwhile work. some old guy who's trying to help with the dysf site. Dave Jackman rides Queenscliff Bombora, which makes the front page of a Sydney newspaper. His board is currently held by Barry Bennett Surfboards, Brookvale. ... I paddled my board out while Claude says he made his approach from a surf boat. 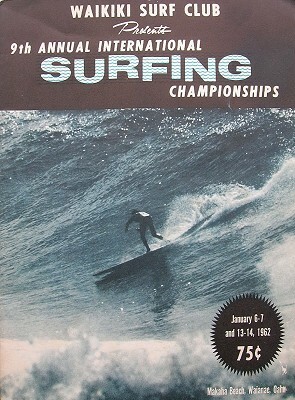 The board is shown on the video cover of Nat Young's The History of Australian Surfing. Foley boards, very short sub 8 ft, have a short lived popularity in Sydney. - McTavish : Pods for Primates Part 1, Tracks Magazine,1972. Named after a US surfer, Jim Foley, who was photographed riding a short board in the second edition of Surfer magazine. - McTavish: Stoked! (2009), page 125. McTavish's 1963 stowaway companion, Dave Chidley, is filmed riding a short (Foley) board with Mick Dooley at Currumbin in Dennis Elton's Follow the Surf (1963). See Thoms: Surfmovies (2000), page 86. John Smythe (aged 13) of Manly, purchased his six foot Gordon Woods ‘Foley’ board in 1962. Gordon Woods made mine and another friend's 6ft 6? board and Scotty Dillon made one for another friend. John Otton had a small board made for him around 1960- it was marble painted. 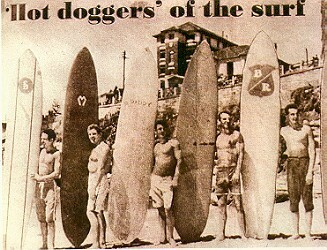 o there was, around 1962-63, a small number of (Sydney) grommets riding short boards. Many thanks to Garry and John. The development of foam boards in the US, circa 1957-1958, is usually credited to Hobie Alter and/or Dave Sweet. In Australia, most larger manufacturers were continuing to struggle with blowing their own blanks. By investing time and effort into blank blowing technology, and securing significant cost reduction by placing large orders, Barry Bennett established an independent foam company (Polytron Foam?) that came to market dominance. It's a long way and a long time from 1962 , when Deborah Kerr and her husband Peter Viertel , who had introduced surfing in France from California, had met with me in London and persuaded me to join them in Bairittz for the contests. I had just arrived from Peru, before that, Hawaii . Peter knew me from the February edition of Surfer International which had announced Pipeline as the new surfing spot because it had just been ridden (outer Pipe) by 2 Americans (Greg Noll and Ricky Grigg) and 2 Australians (Hickey and Bob Pike) of which I was the one who took the biggest wipe-out. That wipe-out on a 32 foot face made a great photo published in the centre of the magazine . I was so ashamed to see that photo. Now I am proud of it , and what we pioneered. Nat Young: History (1983) page 94. Two Australian surfers, Bob Pike and Mike Hickey, happened to be in Hawaii one winter and with a host of Californians and Hawaiians were invited to compete in the first surfing contest in Peru. After the contest Bob returned to Australia but Mike, who had met two French surfers in Peru and had heard about the waves of Biarritz, on the French coast, went off to Europe. The next thing everyone knew Mike Hickey had become the first European surfing champion. In September (1958) a team of Australian Lifesavers comes to Biarritz and rescue demonstrations. The team came without planks swell and is non-existent for the duration of their stay except the last day when the Australians like Mike Hall, show what they can do: start drifting forward, up to two on a plate The premises ... turns discover that surfing is not to do than the wave length. 7 May, 2008: - - Monday, May 12, all surfers are invited to return for a tribute to Peter Viertel, who by that surfing has arrived in France. Meet at 11am on the beach Parlementia (Bidart / Guéthary) with your board. Peter Viertel with a known history of the board arrived in Hollywood and surfed for the first time in September 1956 Hennebutte Côte des Basques, died this winter, shortly after the disappearance of his wife, Deborah Kerr actress and patron of the first French surf club, Waikiki. In his will, Peter Viertel has requested that some of his ashes were thrown into the sea initiative of his family and friends, Joel and Stella de Rosnay, a rally will therefore take place May 12 to Parlementia rather that the Basque Coast for reasons of logistical convenience. As is the tradition of surfing, surfers in the water will form a large circle in which children Viertel will board a boat to carry out the will of the deceased. With high tide at 11:38 and 56 coef forecasts tiny swell up, the conditions are right for one to be very many in this tribute to a man whose friendship and loyalty have done (and still are) the Roots of French surfing spirit. Let the surf in honoring him. 1. General riding ability and versatility. Note: When there is more than one numbered buoy, 5 points will be given for buoy that is passed standing. Two or more points will be deducted each time a contestant goes to his knees or prone position while attempting to complete the ride. Contestants will be allowed to catch as many waves as possible in the time allowed, the best 3 or more rides will be used to determine the winner. All contestants must go outside all the buoys when returning out, unless they are to catch a wave at the location that they turn at. If position is changed due to a bigger set, caution must be used not to interfere with the incoming surfers. We are proud to announce that at the I960 Makaha International Surfing Contest, "Hobie Surfboards" placed 1st in Junior Men's and Women's surfing and 2nd and 3rd in Men's and Tandem surfing. We feel this is a tribute to our surfboards. Every "Hobie Surfboard" is manufactured in our shop under our own quality control from start to finish. This fact, combined with our unequalled experience in the field of surfboard manufacturing and retailing makes us the best equipped to handle the most difficult custom orders. We carry a large inventory of new boards for the customer's convenience allowing for quick delivery on custom orders. We invite you to come in and see our latest models featuring the greatest variety of shapes, colors and laminated strip designs. Geoff Cater (2000-2016) : History : Foam, 1960.